Fantasy Book Critic: PRESS RELEASE: The Terry Pratchett Anywhere But Here, Anywhen But Now Prize Winners Announced! 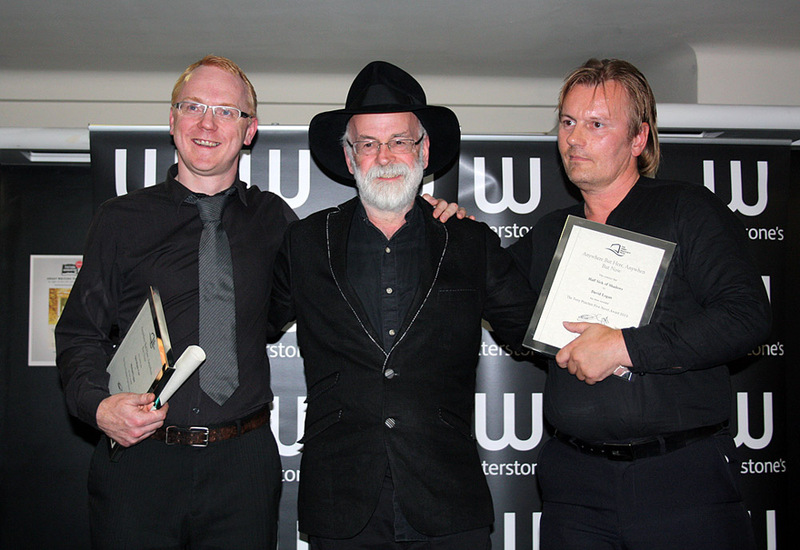 PRESS RELEASE: The Terry Pratchett Anywhere But Here, Anywhen But Now Prize Winners Announced! Sir Terry Pratchett and Transworld Publishers launched a new award for aspiring debut novelists in June last year, the Terry Pratchett Anywhere But Here, Anywhen But Now Prize. After the December 31, 2010 deadline for submissions, 500-plus entries were received for the £20,000 prize. The six judges—including Sir Terry Pratchett and Tony Robinson—met yesterday at Waterstone’s flagship store in London’s Piccadilly to thrash out a winner. After hours of debate the conclusion was reached that it was impossible to select a single victor! The entries were so diverse that it was unanimously decided to split the prize and award it to David Logan for his book Half Sick of Shadows and to Michael Logan (no relation!) for Apocalypse Cow. Both writers will receive a publishing contract from Transworld. Sir Terry Pratchett and Transworld Publishers would like to thank everyone who submitted an entry to the prize. Meeting Sir Terry was an honour. Winning was weird (I've never done it before). It took a quarter century to become an overnight success. I'm Logan David – the one in black.